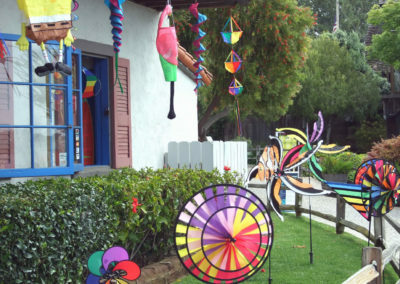 Seaport Village is home to Kite Flite (839 West Harbor Drive, 619-234-5483), where the product is costly—but the choices are abundant, and often on display in nearby Embarcadero Marina Park. The least expensive “Dragon” kite is $12.95. A Parafoil that folds into a drawstring bag and basically flies itself is $39. Acrobatic kites capable of flips and figure eights run from $70 to $200. On June 30, I went to Kite Flite at Seaport Village to browse. I was visiting and years ago had purchased a beautifully bright colored wind ‘swirler’. I was looking for something new. Your sales fellow, Chad, not only sold me something new but enthusiastically gave me a lot of information ibout kites and kite flying. I honestly know very little but began to appreciate the art and sport. I just wanted to complement Chad for his knowledge and his service. It is always a pleasure to visit Kite Flite. Kite Flite is an amazing little shop that has been around forever. The store is stocked with everything for the novice kite flyer to the expert. I had a week of activities planned for three boys and I assure you NOTHING was a bigger hit than our visit to Kite Flite. Pack a picnic lunch and head down to Seaport Village. Let the kids have their own spending money so they know ahead of time what their budget is. Kids will love picking out their own kite, and dont worry “Jim” will happily endure their five thousand questions and help lead them to the right kite for them. The best part: You can walk right out the door and onto the park lining the bay to fly the new kites. We had a great breeze and we saw lots of boats and helicopters as a bonus. The park wasn’t very crowded either even though it was a beautiful summer day close to the convention center and Comicon. The picnic lunch made this one of this one of the most economical, entertaining and relaxing afternoons of our vacation. Location of this store is right on. Right after we bought our kite, we walked down about 50 yards and launched it in Seaport Village, just like that. So don’t worry; should you decide to buy a kite and set it soaring in Seaport Village, and it gets stuck in a tree, just go back to the store and they’ll help you fish it out! Kite Flite is the best place to go if you are a kite enthusiast. Whether you are a mom, dad, grandma, or grandpa taking your child out for their first kite flying lesson, or you are an old pro when it comes to flying kites, Kite Flite is sure to have the perfect kite for you. 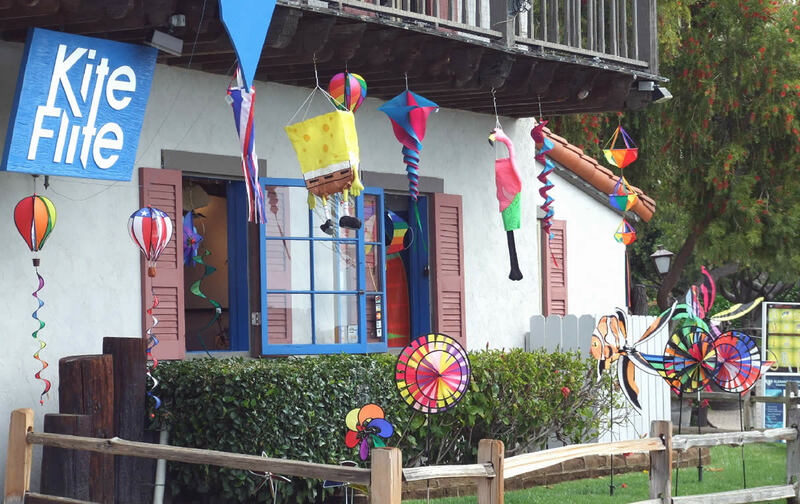 They not only have kites, but also a large selection of various kinds of windsocks, and all kinds of accessories that will help keep your kite soaring high above San Diego. 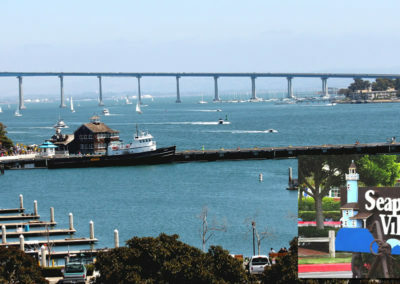 San Diego is like the perfect kite flying city boasting warm days with cool breezes, and lots of parks with open space to run around and fly a kite. The staff really knows their kites, and they even have a try before you buy test fly program, where they will teach you the real way to fly a kite properly. They sell top notch kites, of all kinds, including acrobat stunt kites, and quad line foil kites. Of course, they have a large selection of average, every day kite flying kites as well. 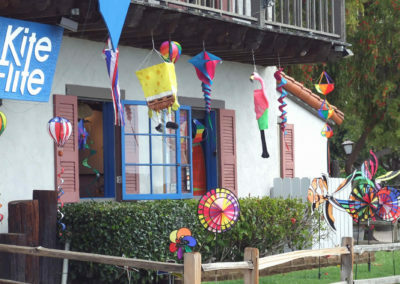 The location of this shop (Seaport Village) just happens to be near one of the best parks for flying kites anywhere in San Diego. The waterfront area makes the breezes perfect for flying kites of all kinds. You really should visit Kite Flite, even if you think you already know everything that there is to know about kites. You wont be sorry that you visited it, and you will definitely learn something new and exciting about the world of kites and kite flying. The quality of the kites in this store is really worth mentioning, some of their kites have a lifetime guarantee, and all though those kites are a bit on the high end, price wise, they are definitely worth the investment if you are a serious kite flying enthusiast.